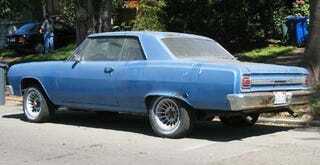 The pre-Malaise Chevelle is a good example of a once-ubiquitous car that has largely disappeared from the streets, due to a one-two-three-punch combo of vulnerability to rust, suitability for hoonage, and high collector value (the same three items are also applicable to the first-gen Camaro). We saw a '71 Chevelle Malibu and a pair of '69s last year, but that's been it for the Chevelle contingent in this series so far. Until today, because I've had these shots of a '65 coupe in reserve for a while and now seems like the time to bring 'em out. This car doesn't seem to move much, judging by the dusty windows, but it looks to be complete and fairly solid. I found it parked on the same block as the BMW 3.0 CSi, though I'm pretty sure they're not owned by the same person. Most of these cars came with 194-cube sixes or 283 small-block V8s, though the options list included the 300-horse 327 (you had to wait for '66 to get a big-block Chevelle from the factory). This car has no 283 or 327 emblems, but there's no telling what's powering it these days; it might be on its 10th engine by this time. The paint is faded from decades of California sun (and we can assume the interior is in similar shape) and the chrome is peeling off the bumpers, but it wouldn't take much to get this car looking sharp. And now, since polls are fun, let's vote on which street-parked Alameda GM A-body is our favorite so far.